Archive photo of road through the Sally Gap in Co Wicklow in inclement weather. BAD ROAD CONDITIONS in mountainous areas in Wicklow, especially around the Sally Gap, saw over 100 people having to be rescued in the past five days. The Dublin and Wicklow Mountain (DWMRT) and the Glen of Imaal Red Cross rescue teams have reported that they responded to eight incidents over the five days. Almost eighty of those people rescued had been travelling in one coach and two minibuses which became stuck at the Sally Gap in sub-zero temperatures, icy roads and continuing snowfall. The DWMRT said that the surfaces of roads in that area were “like sheet of ice” and that other vehicles became stuck as the area became impassable. 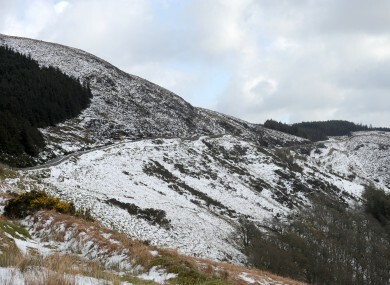 Some people managed to make their way on foot to safety in Glencree while others were transported by mountain rescuers in four-wheel drive vehicles. The conditions persisted yesterday – and mountain rescue teams had to bring families with young children to safety in Knockree after vehicles went off road and became stuck in the freezing conditions. That incident happened at 4.51pm yesterday. While gardai alerted mountain rescue teams to the situation in Sally Gap over the weekend, one motorist told TheJournal.ie that they had seen no signs to warn traffic that the roads were impassable. A spokesperson for the Glen of Imaal rescue team said that they have strongly recommended that the council should erect warning signs and find a way of alerting motorists when the roads are impassable. There are no signs and there never have been. The way the word gets out is basically us (voluntary rescue services) getting on to the media and letting them know. He added that there are over 20 vehicles still abandoned up around Sally Gap after the weekend rescues. “Last night, the rescue involved nine adults, three children and a dog.” He said that while there are obvious signs that people should heed – common sense, for one – when considering whether to drive in mountainous areas, the mountain rescue services believe that proper warning signs should be erected by the local authority. A similar message came from the Dublin Wicklow Mountain Rescue Team. Their spokesperson told TheJournal.ie that it would have been helpful if the council could have erected a barrier on the road to notify people that the way was impassable on Sunday. “The teams will have to go back to the county council on this,” she said. Those who were stranded on the Sally Gap on Saturday, she said, had not been foolish but had been “caught out” by a sudden change in conditions. TheJournal.ie has contacted Wicklow County Council for comment on the issue and is awaiting a reply. The council’s gritting schedule for 2012/2013 shows that major roads such as the N81 and the N11/M11 are the priority for gritting in icy conditions. A number of smaller roads are listed as being ‘priority 2′ on the gritting schedule. These include the R117, R725, R746, R747, R748, R749, R750, R751, R752, R753, R754, R755, R756, R758, R759, R761, R762, R768, R765, R769, R772, R774. 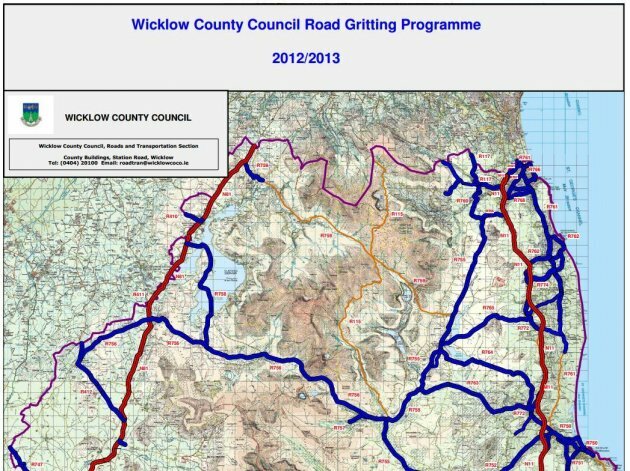 The roads which run through the Sally Gap area – the R115 and R759 – are marked as “regional roads not on (gritting) Schedule”. Email “Over 100 people rescued from Wicklow mountains in 5 days”. Feedback on “Over 100 people rescued from Wicklow mountains in 5 days”.